Rodeo began, it is believed, in 1864 when two neighboring ranches met in Colorado to settle an argument over who was the best at performing everyday ranching tasks. It can be said that rodeo is the only sport derived from an industry, and probably the only one that ever will. PRCA members wanting to qualify for the Wrangler Nation Finals-SuperBowl of Rodeo--generally spend more than 200 days a year on the road. Some cowboys only ride in rodeos close to home, as "circuit cowboys." Many of them take their wives and children along whenever possible, helping keep the sport close to its family-oriented roots. That Famous Preston Night Rodeo started in 1934 and has been going every since since, except for one year during the war. All the cowboys were in the army! This picture shows our headquarters in the fifties. These men were part of the rodeo committee some 50 years ago. That Famous Preston Night Rodeo has continued to offer the wholesome entertainment that started so long ago. The cowboys are as skilled as ever, and the friendships are increasingly strong. We're proud of the rodeo history and are certain that the western heritage will continue. Cowboys are competing for more money than ever before. Marketing and business skills have become as crucial as roping, wrestling or riding skills. Preston attracts world champion cowboys because of our dates, between Cheyenne and Days of 47, and because of our quality of rodeo. Our purse of nearly $100,000.00 puts us in the bracket of one of the best small town rodeos in the West. Today's pro rodeo cowboy has the ideals and showmanship of long ago. His standing in the rodeo community is still dependent on his skill with a rope or his ability to ride a bucking animal. 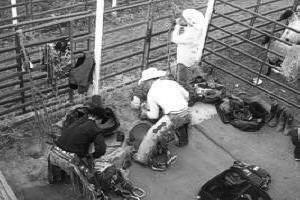 There is a brotherhood among the competitors and a code that dictates that a man help his fellow cowboy, even if they are competing for the same paycheck.